Buy Art History for All a Coffee. ko-fi.com/arthistoryforall - Ko-fi ❤️ Where creators get paid by fans, with a 'Buy Me a Coffee' button. 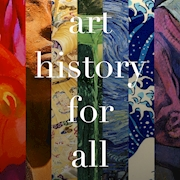 Art History for All is dedicated to increasing the accessibility of visual art by discussing how art from throughout human history is relevant to us right now. This podcast looks beyond the traditional art historical canon and considers a global history of art and material culture in a casual, conversational way, always with diversity and inclusion in mind. Welcome to the Art History for All Ko-Fi! Your tips help support research, production, web hosting costs, and more. If you enjoy the podcast, whether on Apple Podcasts, Stitcher, or in transcript form on our website, please consider buying a coffee for your humble producer/narrator and helping them make art history accessible to all. Secured Payments. Support goes to Art History for All's account. Upgrade Art History for All to a yearly Gold Membership with a one-time payment.